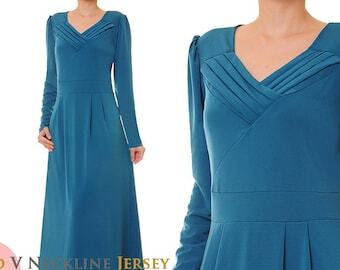 Chest: 36" → stretch to 40"
Chest: 44" → stretch to 48"
CHECK OUT THIS DRESS IN OTHER COLORS! Love this dress. I will likely purchase more in different colors. I went with a dark color just in case the fabric was thin enough to see through it, but I think I'm safe to go with a lighter color next time. I was also worried the material would show everything I had on underneath the dress as some fabrics do but this dress didn't do that either. Very good quality in my opinion, and a very sweet shop owner. Oh, and I was very impressed with how quickly it arrived seeing as it was being sent from a different country. I had ordered other things from other sites that are based in the US and this dress came far quicker. I love Cyn's products. I just wish there were more of her Cardigan Dusters. Major bummer. Also wish they were just a big bigger to fit the more bustier women. Beautiful though! 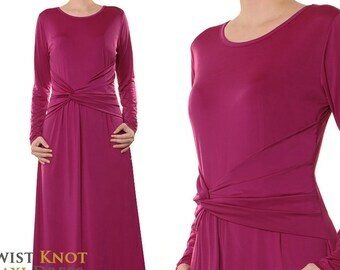 Inside the listing page (description page), we have listed the exact measurement of the dress with "armpit to armpit" (bust) and "length" (shoulder to hem) measurement. Please take one of your regular dress and lay it flat on a surface. Measure from the left armpit point to the right armpit point across. Please use this number as a comparison to our measurements. Please try to find a dress with similar measurements to get a good fit. As for the length of dress, if let's say a dress is 58 inches long, then you ask someone to help you use a measuring tape to measure your body 58 inches down from your shoulder point. You will see exactly where the dress will fall on you. Very sorry, we are not accepting custom made orders or personalized orders at this time. 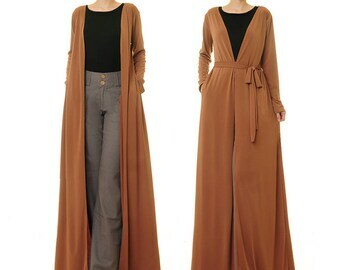 We do not offer length alteration service as well. We only sell item as it is.